This isn't a great picture. It was taken with my cell phone last night before the doctor sewed up the dangly nose bits. She's home now, and aside from a little swelling and a pitiful looking shave-job you can hardly tell it was ever injured at all. Let's hope it continues to heal well. Noses are hard to heal up because of their very nature- wet, rough texture, always into something, lickable at all times. But I'm hopeful. She's in good spirits and sleeping away at my feet. She's a good old dog. And it's not a good time to be an animal in our house. We mourned the passing of poor "Spaz" (J's favorite goldfish) yesterday. He fought a good battle and lived a long (for a goldfish) life. May his little tail flutter in fishy heaven. Just when I thought things were getting back to normal around here something had to happen to throw us for a loop. This afternoon my sister let the dogs out to do their thing, and they got into a scuffle- through the privacy fence- with the neighbor's dog. Now, I'm not claiming innocence on my dog's part here. Kelli is a loudmouth and got the neighbor's dog (also a loudmouth) going. But it was poor old Mocha that stuck her curious nose through the fence for a sniff. According to my sister, the bloodshed was incredible. 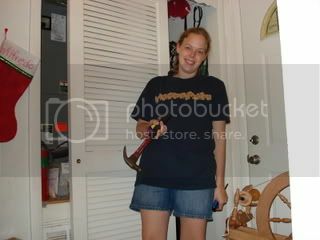 And from the looks of my house, and her clothes, she's not exaggerating. Fortunately, I work for the best vet's office in the county, and we have the best surgeons in the state. Dr. J reattached what he dubbed her "been through a cheese grater" nose in a way that makes it look almost natural. Kelli didn't go unscathed, either. She's got a puncture on her cheek and a cut on her nose. She'll get looked at and the precautionary antibiotics tomorrow. But to make things even worse, the damn neighbor dog later in the evening attacked my sister while she was outside cleaning out her truck. Now, I don't want to start a feud with the neighbors over their dog, especially since they're good folks, and their dog has never been an issue before, but do I wait until it's one of the kids that sticks a finger through the fence? Hopefully lessons have been learned all around. I'll post the gory pictures tomorrow. A visit to the pediatrician revealed that sweet J-man is suffering from his first case of strep. Poor boy. He was so sick by Monday morning that between puking everwhere, he managed to sleep through the entire doctor's visit, and didn't even stir when they gave him a throat swab, and more amazingly, three suppositories. THAT'S sick. And that's after some recovery- not at his worst. We're all sick, actually. Hubby was the last to catch it, and he's suffering through the worst right now. It's not exactly happy times here. But we're slogging through, and I'm actually feeling quite a bit better today. Well enough to be upright without the world spinning out of control around me. Even the dog seems to want to be in on the action. She's got a case of chronic happy tail, meaning she beats her tail against every surface, rendering the tip a bloody mess. Anyone whose ever owned a happy tail dog knows what the aftermath looks like-- an apparent murder scene that would give the folks at CSI a run for their money. So, being fed up with constantly cleaning my walls, floors, doors, and furniture of blood spatter, she is now sporting the latest in doggy fashion. The E-collar is simply to keep her from chewing the bandage off of her tail. It'll have to stay on for another week or so. The only other option is tail amputation, and while that sounds mighty tempting to me- never having to deal with this problem again, and never having to worry about excited little welts all over my legs, I just can't justify major surgery on a perfectly healthy dog simply for my convenience. We'll wait for her to do some major damage, I suppose. But this post isn't all bad. In the time that I've been home, and able to sit up straight, I've managed to finish spinning my first ounce of really pretty roving, and I think that I did a pretty darn good job of it, considering I'm still such a novice. Now to spin up the second ounce, and get them plied properly. And that is all there is to report from here. Haven't done a whole lot of knitting or spinning this week due to all the germy warfare going on. Hopefully that'll change soon enough. Ahh, whatever this winter bug is and wherever it came from, it has settled upon this house like a dense fog. I haven't felt well since Thursday, but honestly, have experienced mild-ish symptoms in comparison to others. At work on Friday, one of the girls and one of the doctors both took early-outs due to the stomach bug from hell, so it's not just here, but everywhere. Yesterday found me completely wiped out, and by 6 pm, I was in bed and sleeping. Stayed that way until 5 this morning when I was awakened by a feverish and panicked-looking J-man who told me "My tummy feels sick," then promptly tossed his cookies on my lap. Sweet. If there's anything worse than having a stomach virus, it's watching your kid have one. So, please excuse the lack of knitting content, or the lack of any content, really. I've got some stuff to share, but it'll have to wait just a wee bit longer. I'm going back to bed, armed with a glass of water, a roll of paper towels, and a puke bucket. Finallly! 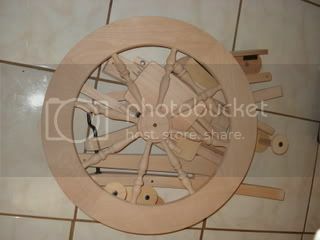 The post about the wheel! I know I promised this ages ago, but I just haven't had a free moment to sit down and blog it properly. I'll try and sneak it in here before the munchkin wakes up. 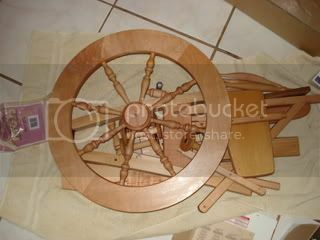 So, the wheel I got for Christmas is an Ashford traditional, and it came completely unfinished. At first I felt a little out of my league having to both finish AND assemble something. I'm not the handiest person in the world. 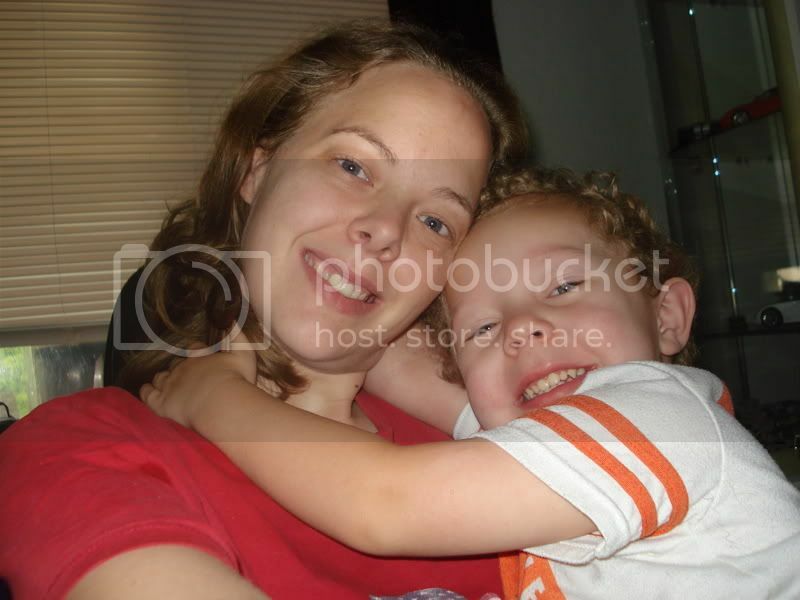 But I really loved the idea of being able to make it mine and mine alone through all the work and detail put into it. Of course, that lead to the second problem-- my complete inability to make a decision. I couldn't, for the life of me, decide what sort of stain I wanted to give her. I mean, sure, it can always be stripped and redone, but that's not something I'd want to do any time soon. So I oogled the literal 100's of choices at the hardware store, and finally, taking cue from my SIL, who also received a wheel for Christmas, decided to just leave it natural and apply a coat of natural wax to protect it. Besides, the natural wood is so beautiful, I don't think I'd like it covered up. Here it is, fresh from the box and awaiting my attention. And here it is after a bit of sanding and applying the wax- I used a product made from beeswax, carnuba and orange oil, so it was a really pleasant chore. Some of those stains smell so bad I don't know how anyone could stand them! Next, I set to work on the actual assembly, which wasn't as difficult as I thought it might be, even with J-man assisting. It only took a few hours from start to finish, and that includes multiple breaks for playtime. I'm only a little jealous that J got to try it out first. 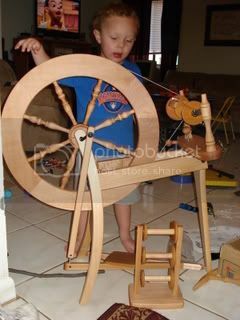 I don't know what it is, but there's something about spinning wheels that totally captivates him. I guess maybe it's just that it reminds him of a pirate ship, but I'd like to at least fantasize for a moment that maybe it's some latent genetic call to the fiber crafts or something. I couldn't resist letting him take it for a test drive. If you remember back to when Michele and I went to the Florida Fiber-In a few months ago, the day was completely ruined by some old crotchedy bag that snapped at him when he was still a good 10 feet away from her wheel because he 'looked like he might touch it.' We ended up having to leave because of his meltdown and honest-to-god fear of even being in the same room with her. Don't worry baby, Mama will let you touch this one. I took an ball of yarn from my stash, tied it onto the bobbin and let him have at it. He spun the entire thing with a fairly consistent rhythm, too. That's my boy. Here's the picture of my very first handspun, ummm... yarn. There's a definite learning curve with spinning. Of course, I never expected to sit down and be an immediate pro, so I don't feel bad about this uneven, over- and under-spun mess at all. Of course, I don't think I'll ever find occasion to actually USE it, either. But that's ok. I've already begun spinning up the few ounces of roving that I picked up at the neeldeworks show, and it is much more consistent. I think it'll make a decent sport weight yarn once plied. I'm thinking perhaps a lace patterned (but certainly not laceweight yarn)scarf might come out of it. I guess it depends on my final yardage. I'm not sure if I even know how to calculate that. 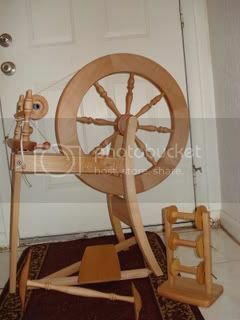 Still on the lookout for books through the library to help me learn more about spinning. I've done some internet searching with limited results, and so I'm going mostly on instinct and what feels right. Anyone know of the knittinghelp.com equivalent for spinners? It is finally cold enough here for me to want to wear something handknit and cozy. Of course, the one sweater I've knit is too short for me, but is being enjoyed by my sister, and the NaKniSweMo sweater is still just a skeins in waiting. But I did dig out my matching calorimetry and fetching this morning to make the trip to work a bit more comfortable. Now I've read nothing but good things about fetching, and they are lovely, comfy, beautiful, but, and this is more of a problem with me personally than the design, my thumbs are cold. I know. I'm a weirdo. But seriously, I never thought my thumbs would be jealous of my wrists the way they are! I think I might have to knit a new pair, only with a complete thumb. I'd also probably do a ribbing at the cast off instead of the picot edge. It's probably more of a yarn choice problem, but my picot likes to roll to the outside and seems a bit baggy. When it behaves, it really is cute, though. Oh well, that's my revelation for the day. 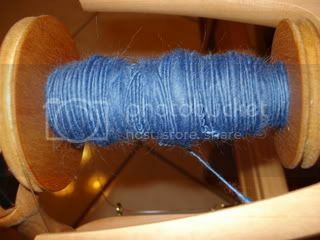 More on spinning when I have more time.